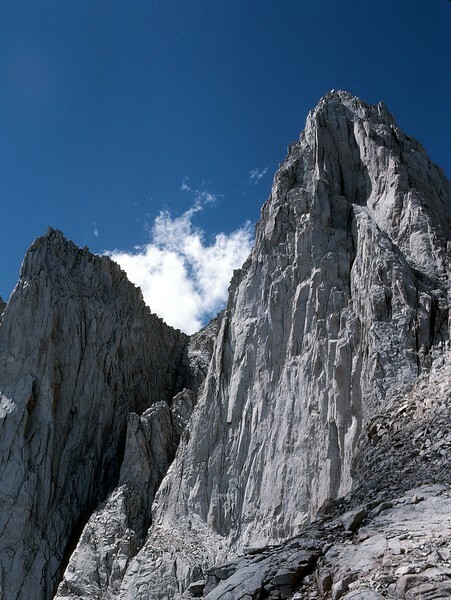 August 16, 1931 saw the first ascent of the East Face of Mount Whitney. 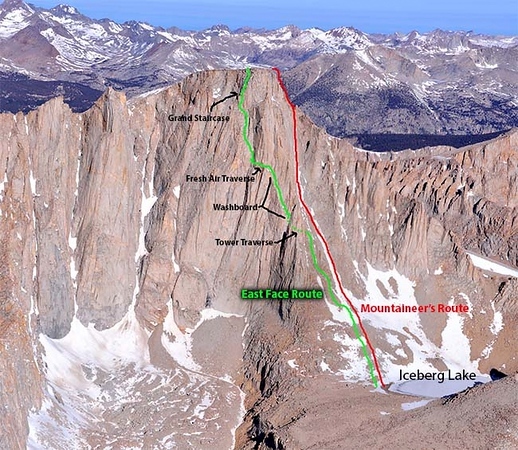 The climb, on the highest peak in the U.S., and the first one on a really big wall in the Sierra Nevada, ushered in a new standard of competence for technical climbs in California. 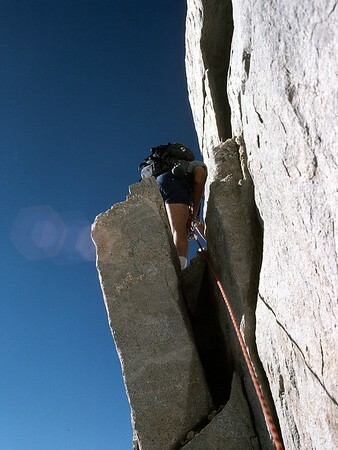 Although not particularly hard (III, 5.6) by today’s standards, it remains one of the classic routes of the Sierra Nevada, due both to its spectacular location and to its place in the history of the Range of Light. 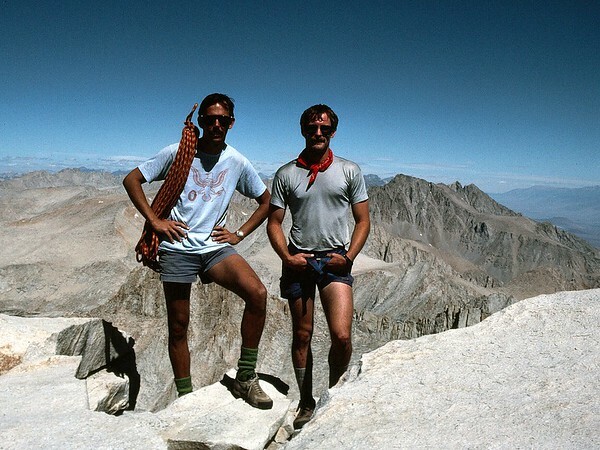 My friend Alan and I were keen to do it for those reasons and, of course, to see if we could. 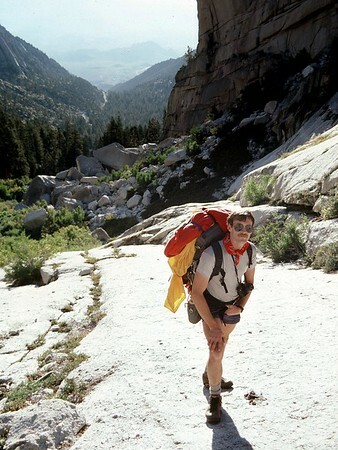 We went for it over the 1985 Labor Day weekend, packing light so as to move fast. 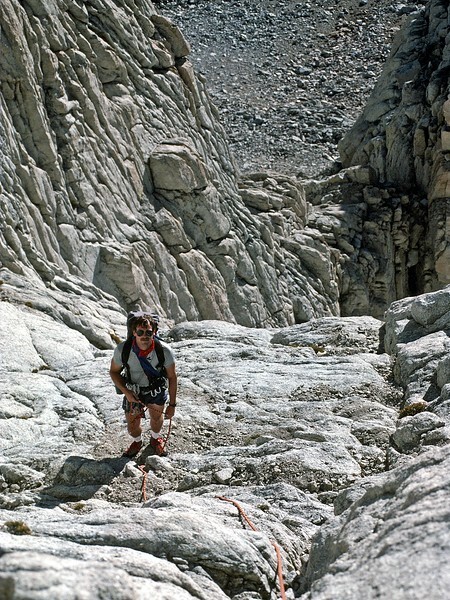 Permit requirements (ones that would keep multiplying and expanding in the years ahead) had recently been introduced in this area but we dispensed with those by driving to Whitney Portal after work, hiking well up into the North Fork, and sleeping under a bush. 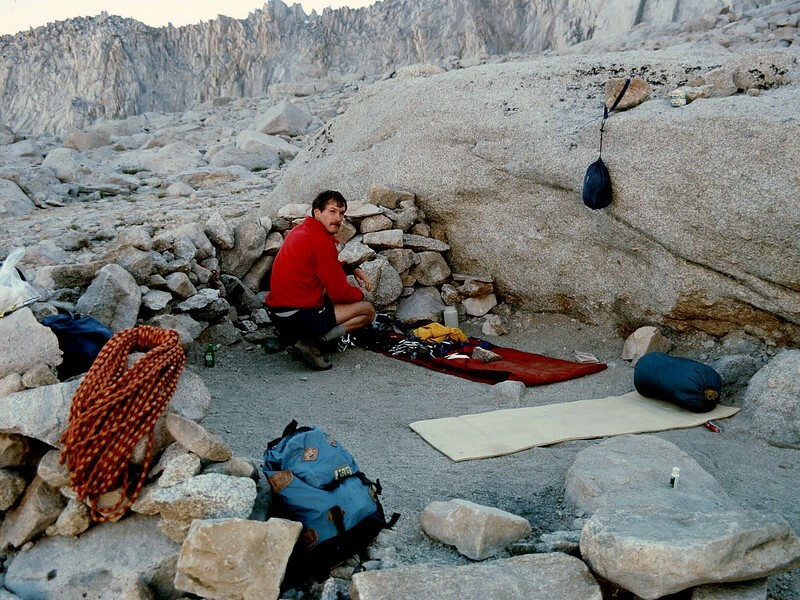 We were up and on our way early the next morning and at Iceberg Lake in time for lunch and some pre-climb relaxation. 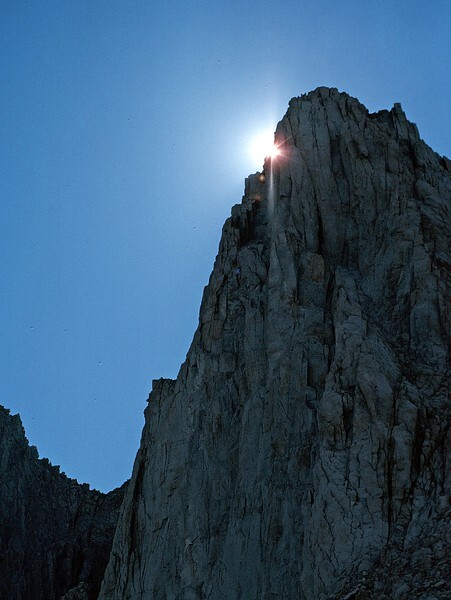 The next day we did the climb – which is TRULY A CLASSIC – with no drama whatsoever – other than the ducking of empty champagne bottles that some besotted fool was hurling off the summit and on to us as we negotiated the Grand Staircase. 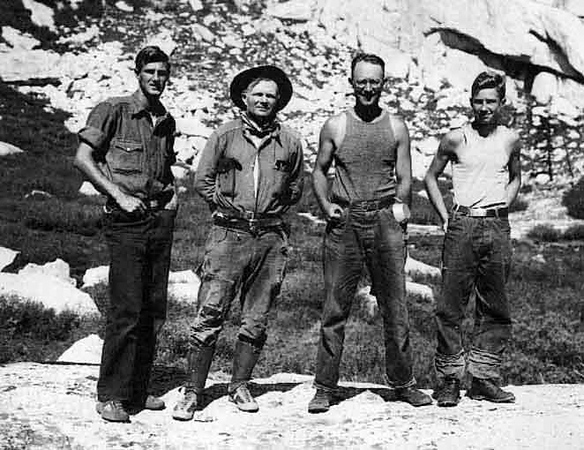 It was the first time broken glass (but not a fool) was included in our list of mountaineering dangers. 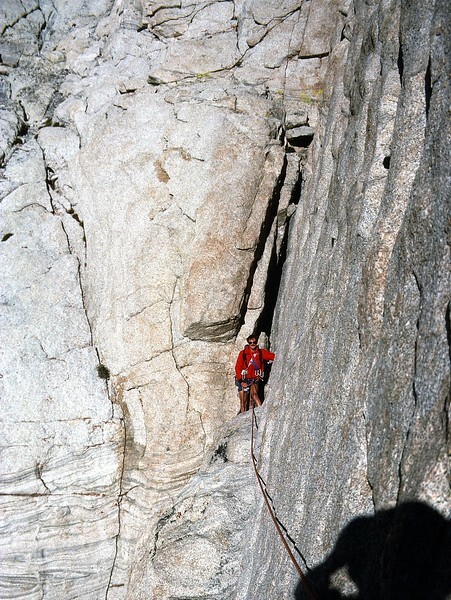 My only regret is that I was too busy either climbing or belaying to have time for the seemingly requisite heroically-dangling-by-one’s-fingertips-over-the-abyss snapshots. 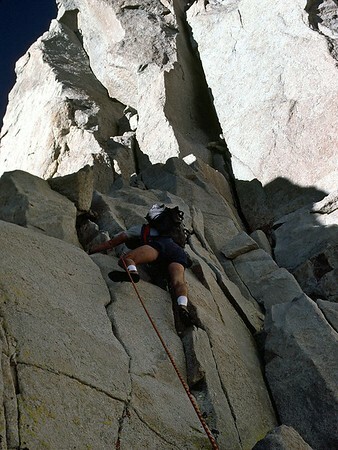 Well, the climbing was great fun nonetheless. Our time on the summit was brief (work was expecting us soon, too soon), so it was down the Mountaineer’s Route (the first and only time I was ever on that route without snow), down the North Fork (pausing only briefly to see if anyone was checking permits; they weren’t, but that too would change), down to Lone Pine, and then toward home along Highway 395. Alan and I didn’t get to do too many climbs together, but this one stands out as one of the very best of the ones we did!